I can't take credit for the rice paper butterflies, they came from an Etsy shop I frequent. She makes lots of edible decor for cakes, cupcakes and cookies! The taste of these butterflies reminds me of the water wafer you receive during communion. Good quality eating chocolate (you can use any variety and if you want to incorporate colors, use white chocolate and color gel). Of course, you can always use the Wilton chocolate melting wafers. Those come in so many different colors! 1. Crush Oreo cookies finely in a food processor. Place the entire cookie (white centers included) into the processor. You want the mixer to resemble a fine crust like crumble. 2. Add the cream cheese and processor until the mixture clumps together. 3. Roll into small balls and refrigerate until firm. 4. Melt your dipping chocolate in the microwave, making sure it is completely smooth. 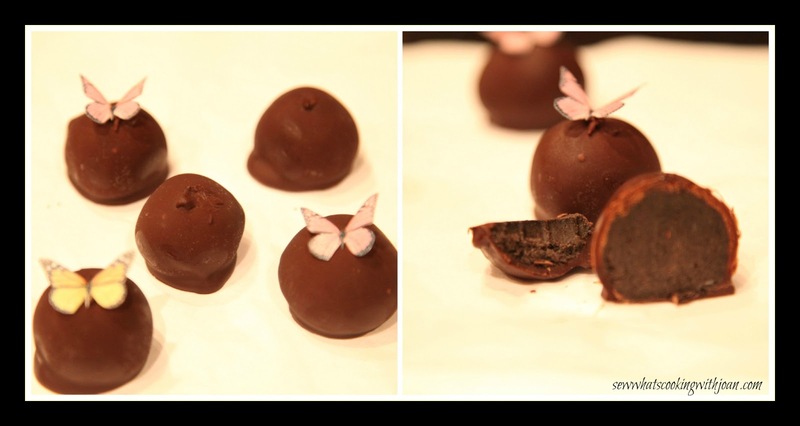 Once my chocolate was melted, I poked toothpicks into the cake balls. This helps give you some hold on them as you dip them into the chocolate. If they have been cooled and stiffed up sufficiently, the toothpick should stay put long enough for you to finish dipping. 5. 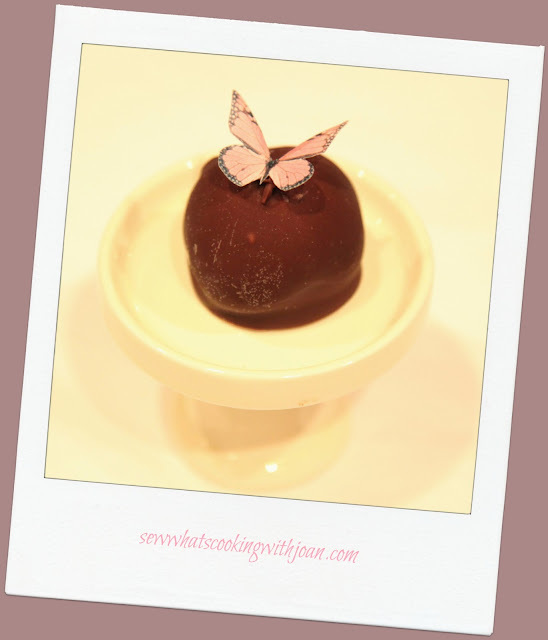 Place your dipped cake balls on a parchement lined baking sheet and once all have been coated, remove the toothpicks from each one and use the left over melted chocolate to fill in the little hole that is left behind where the toothpick was. 6. Once step 5 has been completed, place the balls back into the fridge to firm up, about 15-20 minutes. These also freeze well. Oh, I forgot to mention that to place the butterflies atop the balls, I put a little melted chocolate on a toothpick, then put a little dollop where I wanted to affix the butterfly. These are so easy and are so cute to look at! 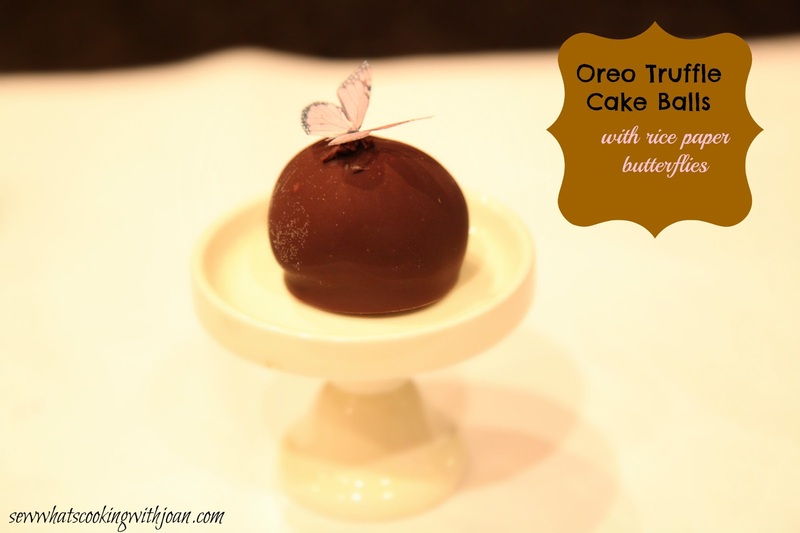 Kids would love to help with these, their little hands could roll the perfect size truffle ball. JJ and I wish you all a Happy Easter and hope to see you back here Monday! WOW! You have out done yourself! These are beautiful!! Very professional! I can't wait for the shower to try them! !